Beer lovers we need your help! Last week LB 314 was proposed in the Nebraska Legislature which includes an increase in state excise tax by over 300%! LB 314 will increase beer excise tax from $0.31 per gallon to $1.38 per gallon making Nebraska the highest in the country. 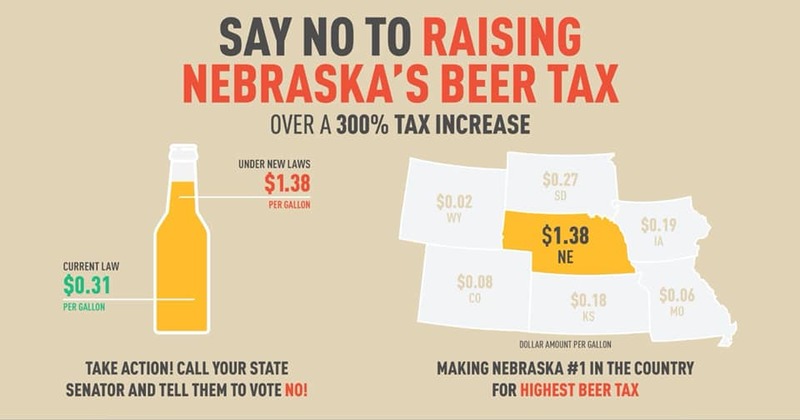 Nebraska already has the highest beer taxes among our neighboring states. This tax increase will greatly impact family owned beer distributors like us as well as other local business in the beer industry. This bill will raise the price of a case of beer by least $2.40 and cripple the beer industry in Nebraska. Please reach out to your state senators and respectfully ask them to oppose LB 314 and support local business. Please join us at 1867 Bar to write to your senator. 1867 Bar will provide paper, envelopes, pens, and stamps. Let’s write and discuss our options.